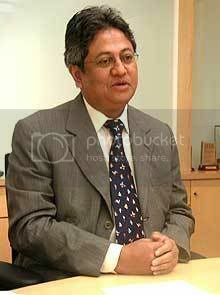 De facto Law Minister Datuk Zaid Ibrahim is not out of the Cabinet just yet. Prime Minister Datuk Seri Abdullah Badawi rejected the letter of resignation Zaid sent in today, telling him instead to take a two-week break. Sources told The Malaysian Insider that Zaid informed the PM that he felt compelled to quit the Cabinet on a matter of principle because he disagreed with the use of the Internal Security Act on journalist Tan Hong Cheng, DAP MP Teresa Kok and blogger Raja Petra Kamarudin. He felt that a minister or government official who is at odds with the policy or decision of the administration must offer his resignation. Abdullah said issues and matters could be discussed and thrashed out in Cabinet. Zaid, who has been at the forefront of judicial reforms, also said that he felt that his resignation would help the PM politically. He noted that his opposition to the ISA and his push for reforms did not go down well with certain segments in the ruling party. “Zaid said he did not want to be a liability to the PM in Umno. Pak Lah thanked him for his concern but said he was committed to the judicial reforms and that he would take his chances with Umno,”” said a source. The lawyer was a popular addition to the Cabinet following the March 8 general election, with many Malaysians hailing his appointment as a sign that Abdullah was committed to improving the judiciary. Zaid pushed for the government to pay ex-gratia payments to judges who were sacked and suspended after the judicial crisis in 1988. He was also instrumental in proposing the Judicial Appointments Commission. But he has faced major opposition from within his own party as some believe that reforms would result in the government having less control over an important institution and in more non-Malays being appointed to the Bench. As a result of this opposition, Abdullah has taken his foot off the reform pedal, promising to hit the full speed button after he secures his position as Umno president in December.